Home→Dr. David Harrison→Thomas Paine Freemason? Thomas Paine, The Age of Reason, Part II, Chapter 1, 1795. Thomas Paine is celebrated today as an eighteenth century revolutionary, radical and republican who wrote countless controversial but ground breaking pamphlets, such as Common Sense and The Age of Reason. He also wrote the enigmatic Origins of Freemasonry, published posthumously as part ritual exposé and part Masonic history. His interests in Freemasonry were obvious, and the fact that some of his supporters and associates, such as Benjamin Franklin, George Washington, James Monroe, La Fayette, Nicolas de Bonneville and Richard Price, were Freemasons, has led some historians, such as Margaret Jacob, to believe Paine was also a Mason. Certainly during the nineteenth century, Masonic historians such as R.F. Gould and A.F.A. Woodford went to painstaking lengths to distance Paine from the Craft, his very association to Freemasonry causing embarrassment and shame, with Gould even stating that Paine wasn’t the author of the exposé. Woodford dismissed Paine’s involvement with Freemasonry, declaring that his exposé had no value, and contemptuously stated that Masonry was no way honoured with Paine’s connection, not wanting the Craft to be associated with such a political radical. Ironically, all of the attention that Paine received from Masonic historians was seen as proof in itself in some circles. Paine’s colourful life began in Thetford in 1737. He was set to follow his Quaker father as a corset-maker, but he was never at rest and constantly sought knowledge. His first wife died in childbirth, and Paine seemed to enter a period were he did various jobs, drifting into teaching and finally working in excise. He married for a second time, though they were to separate as Paine’s interest in politics developed. His first foray into the political arena was to petition Parliament on behalf of his fellow excisemen for better working conditions, an adventure which led him to the London coffee-houses and to a meeting with Freemason Benjamin Franklin, who was visiting London at the time. Paine’s lobbying was ignored and he lost his job as a result, so in 1774, on invitation from Franklin himself, he left for the American colonies. Once there, Paine settled into Philadelphia and with an introduction from Franklin, he became the editor of the Pennsylvania Magazine, quickly becoming a man of letters, embracing the spirit of reform in America and spearheading the anti-slavery movement. Indeed, Franklin was constantly name-dropped into his writings, Paine using him as a seal of approval. It was his use of ‘common’ language, so easily understood by the America people, which made his pamphlet Common Sense so successful during the American Revolution, gaining Paine the admiration and support of another Freemason, George Washington. Paine’s writing skills and friendship with Franklin and Washington enabled him to stay at the forefront of the political action and he was made secretary to Congress’ Committee for Foreign Affairs from 1777-79. After Paine left the position, he continued to be active in foreign affairs, and letters from Paine to Washington reveal a personal friendship at this time, Washington arranging a hefty salary for Paine. Despite this, Paine was not happy at the way the Revolution was going with the political power being shared by the landowning elite, and he began to make enemies. In 1787, Paine returned to England, were he once again entered into political debate, joining radical clubs in London with William Blake (no stranger to Freemasonry himself) and promoted his invention of an iron bridge. When the French Revolution erupted in 1789, Paine saw an opportunity to start again and wrote The Rights of Man in response to Edmund Burke’s rebuke of the Revolution. Burke had written in answer to Richard Price’s sermon on the Revolution, and Paine defended the Freemason Price, confirming the natural rights of man against the tyranny of Kings, supporting the ideas of the Enlightenment made popular in France by Voltaire. Paine fled for France on the advice of Blake, and again with the help of friends like the Freemason La Fayette, he entered the political arena, assisting in forging the new French Constitution. However, events soon turned sour with the Terror, and as an Englishman who spoke no French, he began to attract suspicion and gained enemies after pleading for the life of King Louis. He was imprisoned and only released by the intervention of another Freemason, James Monroe in 1793. Paine stayed on in France living for a time with Monroe and another Freemason Nicolas de Bonneville, where he completed his most controversial work to date: The Age of Reason. Spiritually, Paine supported the approach known as Deism – a belief system which derives the existence of God based on Reason as apposed to sacred scripture, and in The Age of Reason, Paine refers to God in a scientific sense as a Creator of a mechanized Universe. Disillusioned, he finally departed to the USA in 1802 with the help of Thomas Jefferson, who had also moved in a Masonic milieu, although actual proof of his membership has never been found. 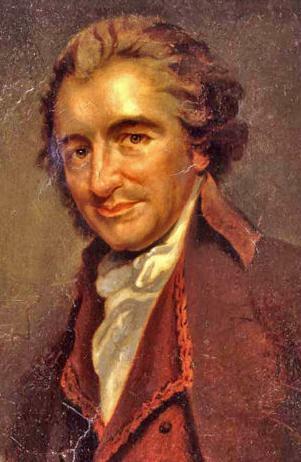 Paine died seven years later. Paine sought a Utopian vision for the world, embracing the recognizable essence of Freemasonry, promoting ideals such as democracy, education, morality, religious toleration, and the fashionable Newtonian natural philosophy, Paine sharing Newton’s views that the existence of God was to be found in Nature. Indeed, in part one of his Age of Reason, a number of chapters are dedicated to the Newtonian system of the Universe, in a fashion which is very similar to the presentation of the Craft ritual, giving an almost poetical description of the Earth and five other planets rotating around the Sun, explaining how gravity orders the harmony of the Solar system. The search for the hidden mysteries of Nature and Science certainly captivated Paine who himself dabbled in architecture and experimented with inventions, designing an iron bridge and a smokeless candle! His Origins of Free-Masonry, which was regarded after his death as a missing chapter belonging to the unpublished third part of the Age of Reason, presented a description of the Masonic ritual along with his theory that Freemasonry was a form of Sun worship. Curiously, the essay fits in with his work in the Age of Reason, and as a whole it follows a mystical Newtonian theme of a modern ordered Universe that complements God as being revealed in Nature and Reason. The work certainly echoes Masonic themes, with Paine using ancient knowledge by Euclid to support his views on the Newtonian Universe and discussing the Biblical cubit, a measurement used in the construction of Solomon’s Temple. Paine did however make a lasting contribution to Freemasonry, his Origins being influential to Carlile’s Manual of Freemasonry, Carlile quoting Paine when writing his thoughts on the Craft’s history. A number of lodges in the USA were also named after Paine, and when he died many lodges throughout America honoured him. If Paine did enter into Freemasonry, it would have been during the period of the American Revolution, his life being at the epicentre of the social elite at that time, his closeness to Franklin, Washington, La Fayette and Monroe suggesting that he was undoubtedly aware of their Masonic membership. Paine was certainly attracted to clubs and societies throughout his life, such as the White Hart Club which Paine attended when he was an exciseman in Lewes. He was a founding member of the first Anti-Slavery Society in America and he was involved in the society of Theophilanthropists and Philosophical Society, in which he discussed the Newtonian Universe and Euclid’s geometry. Paine was unquestionably informed by the ethos of Freemasonry, an ethos that influenced his writings and inspired his vision of a just and fairer society, an aspiration wholly in accord with Freemasonry today as much as in the later eighteenth century. What was dangerously revolutionary and radical then, is much applauded now. The above article is copyright to Dr David Harrison, 2009. This article originally appeared in Freemasonry Today, 2009.